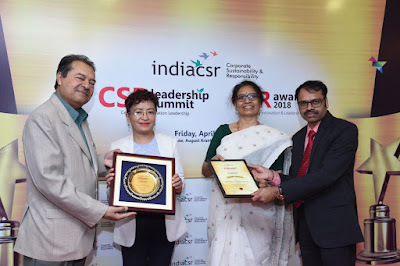 Honeywell has announced that its not-for-profit entity Honeywell Hometown Solutions India Foundation (HHSIF) has received the India Corporate Social Responsibility (CSR) Award for its safe drinking water program in Telangana. The award was presented to Honeywell at the annual India CSR Leadership Summit & Awards in New Delhi, which honors outstanding and innovative CSR, sustainability and social enterprise projects. Honeywell is funding 130 safe water stations in Telangana via its not-for-profit partner Safe Water Network. These stations provide access to safe drinking water for 420,000 people in areas that suffer from groundwater contamination due to factors such as salinity, nitrates and fluorides. Fluoride contamination can cause skeletal fluorosis, stunting and teeth mottling among youth, and spinal bending, joint pain and difficulty in mobility among the elderly. “We are honored to receive this prestigious recognition. This initiative is one of our flagship CSR programs that is transforming health, increasing productivity and improving the livelihoods of hundreds of thousands of people in the state – all of which are the imperatives that help drive the Prime Minister’s ‘ease of living’ vision,” said Vikas Chadha, President, Honeywell India. “Honeywell is committed to improving the world we live in by creating, supporting and nurturing outstanding CSR programs that make real, sustainable and measurable impact on the communities that Honeywell serves,” Chadha added. Through this award-winning program, Honeywell and Safe Water Network set up locally-owned and operated safe water stations that deliver safe, affordable, and reliable water adhering to the Bureau of Indian Standards (BIS-10500) for potable water quality to those in need. Community engagement is key to promoting safe water adoption, which begins with door-to-door consumer outreach. Local stakeholders are mobilized to ensure people understand that investing in safe water will help reduce healthcare expenses and increase productivity. Over the last two years, Safe Water Network and Honeywell India have already set up more than 100 safe water stations across the Karimnagar, Adilabad, Warangal Rural, Warangal Urban, Jayashankar, Mahabubabad, Jagtiyal, Peddapalli, Badradri, Mancherial, Suryapet, Khammam, Medak, and Nalgonda districts.